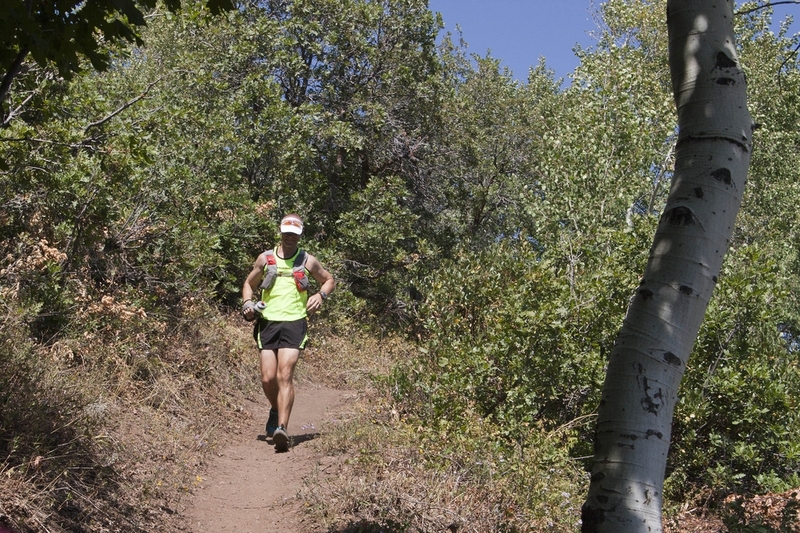 The Wasatch 100 is known as being the 2nd hardest 100 mile endurance run in America behind Hardrock. There was no doubt that it held up to its name. The day started as "normal" of a 100 mile event can. Butterflies, question, uncertain thoughts...you know normal. 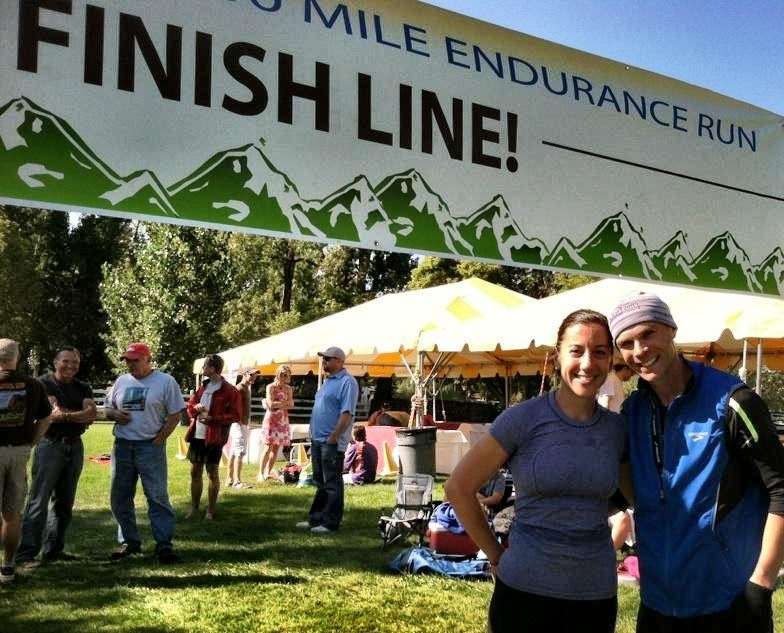 This race was set differently for me as it was an attempt to redeem myself after the DNF at Bighorn. The thought was to go out early and evenly. I did just that moving through the front 20 miles with no problems. It was a wonderful feeling to feel strong yet loose almost like I was gliding along. The hills were tough but forgiving footing which made it a nice climb. At the marathon mark I was sitting in the top 30 and had a lot left in the tank. I did not want to push it out as I knew a lot of miles needed to be run. So I held back and cruised which was a very smart move as I learned over the race. When I made it to mile 39 I had my first chance to see Meg and family. Oh that was a great feeling. I had lost 5 lbs. in the heat but was feeling strong and confident. I knew I had 36 hours to complete and barring some big screw up I was good. It was great seeing Meg as she had told me earlier that she would pace me the last 25 miles if needed through the night. I told her at that point to get some rest because nightfall would soon be here and she and I were going on the attack!!! One of my favorite moments of the race was at mile 40. I am hiking up a trail and Karl Meltzer comes running down as he was out for a fun run. He pulled over and we spoke for a few minutes. I asked if he wanted to run a few miles. He smiled and said absolutely...HOLY CRAP I WAS BEING PACED OUT BY KARL MELTZER. That was awesome. We talked for a few miles and he was extremely nice. He told me a few secrets about the course. Before he left he gave me a big high five and told me to keep cruising. I was looking good and in good spirits and he knew I was going to finish. That was insane!!! Coming into Mile 52 aid station I got another chance to see Meg and family. Her Aunt Mary was there as well which was great to see. This race finishes in her backyard and I had not seen her in sometime. That was a nice surprise. This is where my race almost went to crap. I was being weighed at the aid station and they told me that I had lost about 9 lbs. They didn't sit me down but told me to "load up" before I left. I sat and put all kinds of stuff on my stomach. Stuff that I would not typically eat. Well after changing clothes and heading back out I could tell my stomach was jacked completely up. I was burping and was worried it was coming up. I made my way slowly to the mile 62 aid station and knew I needed to sit. When I came into mile 62 aid station one of the guys said "you look green" and yes I felt green. I sat down and knew I needed to get my stomach right. After 45 minutes and a lot of soup, crackers, and Gatorade I was off. I felt incredible and like I was coming back to life!!! Thank god for the incredible crew out on the course. They were great. Oh and I found out that the scales at mile 53 aid station were off and weighing everyone lighter than they really were. Great...so all that junk I put down to "gain weight" didn't really need to be put down. 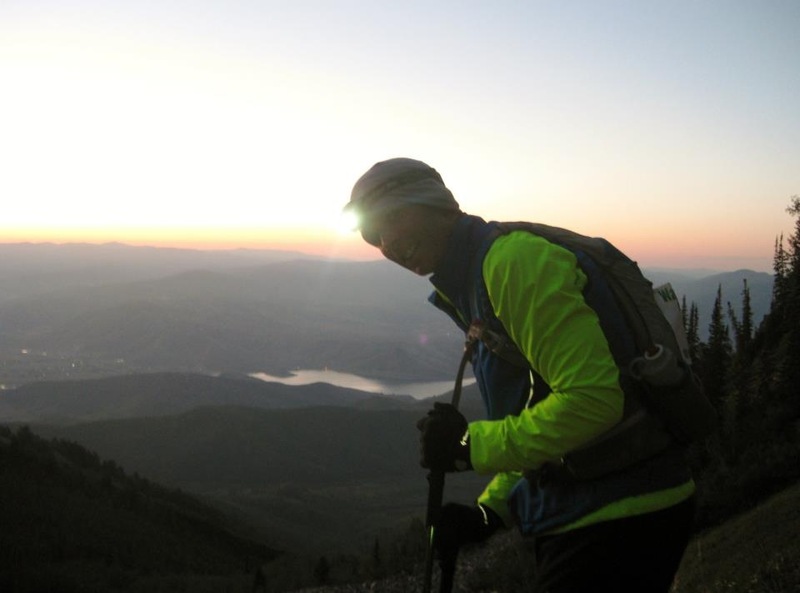 Now quite often in a 100 mile event the fun never begins until the sun goes down and this was the same. Night fall came with hiking. I am legally blind and have slow reaction time so running at night is very tough for me especially on any kind of technical footing. I just cannot pick up sight fast enough to know exactly what I am stepping on. So it was hiking for me with my Black Diamond Z Poles. With the night came cooler temps as we pushed the miles. Knowing what was coming sucked at that point. It was almost 2AM and we had the tallest climb on the course left...FRIGGIN GREAT. 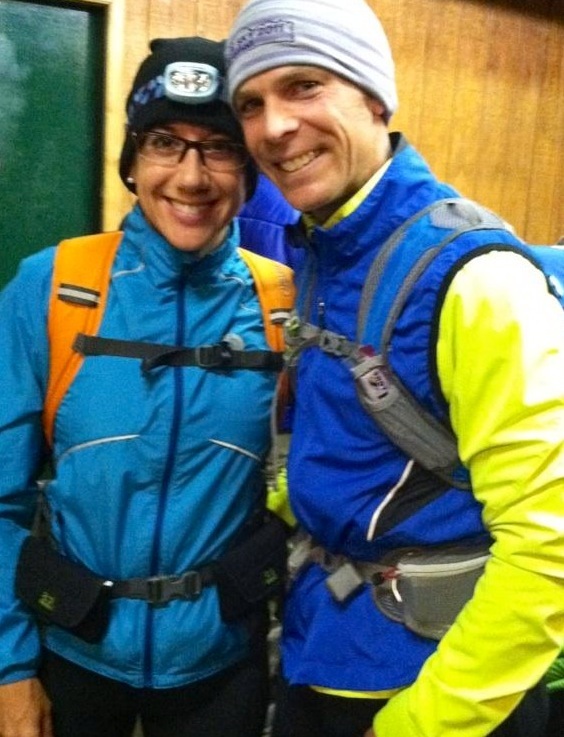 Meg was an incredible pacer as she let me struggle but encouraged as we snaked along to the top. That was the biggest fight of the race and it was done. At that point it was just hike and wait for daylight...THANK GOD!!! Somewhere around mile 85 we came to another aid station that had REAL food like bacon, pancakes, etc. Let me just say...the crews working out there were perfect. Thank you all for all of your help. You made this event a great one!!! Ahhhhhh daylight!!! As daylight started to break I could feel another "wind" coming. I thought once I got to another day it would be like training. I was finally right for once. My mind became clear, legs felt more alive, and I was ready to run. At mile 88 I looked at Meg and said let's go. I dropped at Chocolate Cherry Clif Shot (www.clifbar.com) and we were off. I have done this before when I get to mile 90 and can see the light at the end of the tunnel. I started doing the numbers and thought we were going to go sub 30 hours. Man that was a great feeling but we had a HUGE descent coming. The downhill almost killed me. My feet were kicking rocks and I thought my toenails were falling off. That to me was the hardest part of the entire race. That was absolutely brutal but we did it. When Meg and I came into Mile 94 we were there for a few minutes. Stopped off, verified mileage, loaded up and were off. At this time it was 8:26 AM (I will never forget that). I did a quick number check and said...7 miles in 2.5 hours. We got it...SUB 30 IS MINE!!! The last few miles went by fast as I was ready to be done. Finally the end was near. Meg and I hit a road and knew the finish line was just down the road. Oh man what a feeling!!! As we came into the shoot I kissed Meg and went blazing in to a 29:13. IT WAS DONE!!! 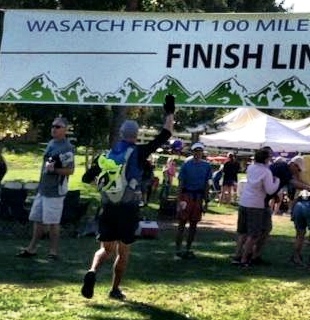 I had just finished my first mountain 100 and was feeling good. All in all...5 toenails lost, sunburned, exhausted, and BUCKLED!!! Thank you to Meg, Faustine & Ted Settle, and EVERYONE on the course. This was a class act event and I will be back for a faster trip!! !